The key word is 'Professional'. At the Window Viper we strive to give you that same courteous service you'd expect from any five star service. Your particular wants and personal concerns are what we are here to accommodate. With close to ten years of experience under our belt, you will not find yourself among a more presentable, and personable crew to give you the perfectly clear windows you want. We can handle any size job from 25 storey high rise towers, to a simple one storey bungalow. Your glass will gleam as if it were brand new again thanks to the perfect blend of technique and state of the art equipment. We will remove your screens for you, and dust off the cobwebs and such as a standard part of our cleaning routine. Ledges and tracks will be wiped clean, and dried. We offer deep window screen cleaning as well. The screens are all removed and fully washed with soapy water, rinsed, dried, and replaced. ​You have a million dollar view, let us give it that diamond shine it deserves - but why stop there? We also wash glass railings, skylights, mirrors, chandeliers and more! If it's glass, we've got you covered. Window Viper provides the best interior window detailing in the industry. Letting someone into your home to clean the windows is awkward for some people, so when you hire us, our customer service skills are what set us apart from the rest. Our non smoking crew are clean and polite; and can keep quietly to themselves while working. We always insist that interior cleans be done first thing in the day so we are as clean and dry as possible. All equipment is cleaned and drop cloths are always in place. Each and every pane of glass is cleaned using top of the line razor scrapers & squeegees equipped with special ﻿streak proof rubber. Hard to reach areas? Windows above ponds, pools, or garden trellis might seem like a challenge. There are as many solutions as there are challenges that can be simply overcome by employing special extension poles, tucker poles, or even reaching around from inside. 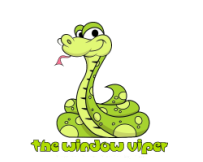 Then Window Viper has the tools, and the confidence required to make your window cleaning as safe and effective as you'd expect from the best. Disclaimer: We will not touch any windows or screens that appear to have any existing damage. If we encounter any pre existing damage it will be duly noted before cleaning begins. Any damage found after the service that was not noted before cleaning will be deemed as pre existing. Ladderless Window Cleaning - "Squeegees Are Old School"
Welcome to the future of commercial window cleaning. What used to cost thousands of dollars renting loud cumbersome man lifts to reach fourth and fifth story windows can now be done at the same price as ground level windows - in a fraction of the time. Newly developed technology has made it possible to clean high windows, from the ground. Tap water is filtered through a special De-Ionizing resin which is then transferred at low pressure into a brush at the top of a light weight carbon fibre telescopic pole that can reach 60 feet. Our skilled technicians can then lubricate, agitate, and remove all dust and other matter from the glass and leave the window to dry naturally without the need for squeegees or towels. The purified water has 0.00 ppm and therefore is impossible to dry with any trace minerals that otherwise would leave milky white residues from minerals or detergents. The benefits of this new technology are HUGE - Not only for your budget, but also for our safety. Welcome to future of professional window cleaning!